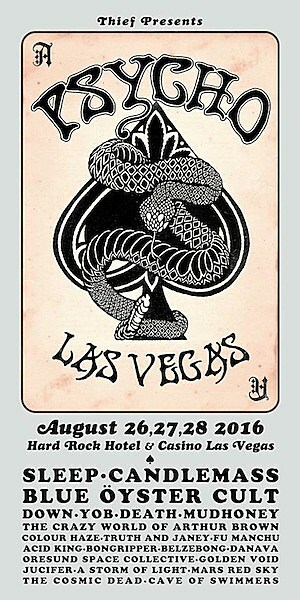 This year’s Psycho Festival has relocated from Santa Ana, Calif. to the City of Sin, Las Vegas. The fest will befittingly be held at the Hard Rock Hotel and Casino. With more announcements still on the way, the lineup is already a can’t-miss featuring the Philip Anselmo-led supergroup Down, rock icons Blue Oyster Cult and doom legends Sleep and Candlemass. Psycho Las Vegas will boast three stages, tattoo artists, art exhibits, a black light chamber, a custom van and chopper show, a pinball arcade and more from Aug. 26 – 28. So far, 23 bands have been announced, but the festival promises to top the 60 band mark set at last year’s installment in California. The first wave also includes YOB, punk rockers Death, grunge pioneers Mudhoney, shock rockers the Crazy World Of Arthur Brown — best known for their hit “Fire” — Fu Manchu, Acid King, Bongripper, Danava, A Storm of Light, Jucifer, Pentagram and many more. The festival decisively leans towards grunge and doom, which will serve to match the sloth-pace the desert heat can bring out in Vegas. ← Jennifer Lopez SLAYED Her First Vegas Show As Justin Bieber, Rebel Wilson, Kelly Osbourne, & More Watched — Get All The Highlights!